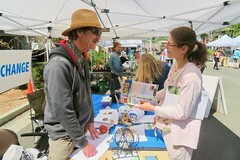 We celebrated Earth Day with a wonderful afternoon of art, music and talks about protecting our environment. Hundreds of activists, artists, environmentalists and youth gathered to pay tribute to Mother Earth at Tamalpais High School’s Student Center in Mill Valley on April 22, 2018. For a quick overview of our community celebration, watch our video slideshow (shown above). We started the day with the first public showing of our Art Float for Social Change. This unique parade float was created by Fabrice Florin and Geo Monley with over a hundred volunteers in the Tam Makers collective, to inspire more people to participate in democracy. Pictured here is young singer Emma Spike, who performed ‘Custodians’,her original composition about climate change. A large globe spun over a circle of hands and a carousel of art, pulled by a colorful dragon. The feathered dragon was inspired by Quetzalcoatl, the Aztec god of wisdom, and created by Howard Rheingold, Fabrice Florin and friends at Pataphysical Studios and Tam Makers (see photo below). Activists of all ages stood on the decorated stage to share their ideas for a better world, including young singer Emma Spike (shown in the cover photo), Kayla Campbell, Mimi Lawrence, Eileen Fisher and more. Many more painted original posters about the earth, which were featured on the float carousel. We are grateful to Bruce Burtch and his team at Youth Poster Contest (he is pictured below), for working with our volunteers Sarah Acker and Vanitha Sampath to coach young people in this art activity. 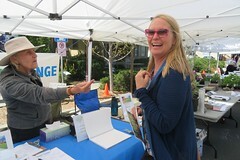 Dozens of environmental partners showed participants how we can all take action to reverse global warming — organizations like the Drawdown Marin (pictured above), Sierra Club, Resilient Neighborhoods and 350 Marin, to name but a few. Our guest speakers were Mark Squire from Good Earth, Crystal Chissel from Project Drawdown, Marin Supervisor Damon Connolly and young local activists: they gave informative talks on a wide range of solutions to curb climate change. Participants also learned to plant a veggie garden, ride an electric bike, while others registered to vote (we helped 5 teenagers pre-register to vote at this event) . We ended the day with music performances by the charming Twinkling Stars of Singers Marin, led by Dana Cherry (pictured above), as well as young singer Emma Spike (see cover photo). Music director Reed Fromer (pictured above) led moving sing-alongs with the Freedom Singers and Mill Valley Seniors for Peace (see photo below). Earth Day 2008 brought together diverse groups of people who might not have connected otherwise: activists, artists, environmentalists, makers, children, teenagers, teachers and parents. We are particularly grateful to all the young activists who participated in our celebration, including Jackson Darby, Ben Kanter, Jillian Hickey and Elly Blatcher (pictured below with their ‘Don’t Bug Me’ exhibit) and their teacher Joanna Saunders from the Marin School of Environmental Leadership . This community gathering was produced by Democracy Cafe, Eco Warriors of MVCAN and Tam Makers, with the generous support of Tamalpais High School, Mill Valley Community Action Network (MVCAN), Good Earth, Driver’s Market, Sloat Garden Supply and all our gracious partners, who are listed below. Thanks to event organizers Fabrice Florin, Marilyn Price, Jennifer Tomkins, Geo Monley, Carol Korenbrot, Elspeth Martin, Grace Severtson, Laurie Riley — and all the wonderful volunteers who helped produce this inspiring event. Special thanks to the photographers who took the pictures featured on this page: Bruce Burtch, Fabrice Florin, Bill Jensen, Howard Rheingold, Grace Severtson, Jenny Tomkins and Martha Ture (and to the videographers whose work will soon appear above: David Donnenfield, Tim Pozar, Bob Harlow and Chris Scofield). 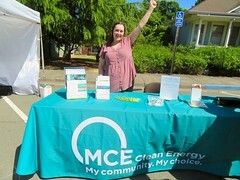 View more of their work on our Earth Day photo album. We think making art, playing music and talking with people of all ages and backgrounds can build mutual understanding and get us all more engaged as citizens. Join your neighbors to make political art and music, and take action together to create a better world! To see more images of our Art Float in action, visit our photo album on Flickr and/or our favorite photos on Facebook. To see how we are building it, take a look at our Art Float Creation photos. Once you see how much fun everyone is having on this project, sign up here and join us! You and your friends are welcome to march with our Art Float for Social Change at the Mill Valley Memorial Day Parade on May 28, 2018, 10am-1pm, with members of the Tam High community and the Mill Valley Community Action Network. Please RSVP here to save your spot. Would you like to help pay for the Art Float, so we can finish it this spring? Please make a donation on our Memorial Day page, even if you’re not coming to that event. Thank you! Please visit our partner and sponsor sites, and sign up for their projects, if they appeal to you. After the event, we invited participants to give us feedback through an online survey that received 48 responses. People told us they really enjoyed this event, its creative energy, and the combination of entertainment, information and community. Survey responses show they liked the art, music and meeting people the most, and also liked the partner tables and speakers. The majority of participants thought the event helped build a community of activists, promoted environmental causes, welcomed young people as citizens and helped each of us take action. This entry was posted in Art, Community, Maker, Politics and tagged activism, Art, community, earth, earth day, earthday2018, environment, event, float, global warming, marin, meeting, mill valley, music, neighbors, politics, science, talk, tam high on April 25, 2018 by Fabrice Florin.